Many factors contribute to menopausal irritability, and no matter what the causes are, feeling irritable on a regular basis can be detrimental. However, once you acknowledge that you have a tendency to become irritable, it becomes easier to reduce the frustration. Find out five common symptoms of menopausal irritability here so that you can lead a more emotionally stable life. A small amount of stress in life is healthy, and even necessary. However, when stress becomes chronic and overwhelming, it can pose a serious health problem. If you feel irritability building up due to stress, it is a good idea to acknowledge this, and find a way to reduce the tension through stress-relief techniques, such as by exercising with yoga or tai chi; finding a creative outlet; or talking to someone that you trust. Sleep deprivation is a common cause of irritability in general, but it hits especially hard for women going through menopause. Other related symptoms, such as night sweats and sleep apnea, can interrupt sleep cycles and cause a sense of fatigue and irritability that lasts throughout the day. To prevent this, find ways to achieve restful sleep. For example, going to bed at the same time every night, avoiding distractions before bed, and only going to bed when you are tired can help cut back on insomnia. All symptoms of irritability contribute toward a shortened fuse, and interpersonal relations can suffer as a result. Women may find that menopausal irritability magnifies the negative qualities of others, and habits that were once overlooked become glaring faults in their eyes. Whether at work or in personal life, this can negatively affect the overall well-being of everyone involved. It's important to pick your battles when it comes to little things that upset you. No one likes to be kept waiting, and when they do have to wait, it's natural to become slightly annoyed. Impatience can take place in any situation, from waiting in line to having a conversation with a friend. So, when you feel impatience coming on, stop. Take deep, slow breaths, and count to 10. This will help slow a speedy heart rate and relax your body, allowing you to distance yourself emotionally from the situation. A compound of all the symptoms of irritability, overreaction occurs when levels of impatience and intolerance surpass a normal response to the circumstances. Frustration can lead to lashing out in anger, snapping at loved ones and strangers alike, and generally expressing annoyance over things that used to be trifling at the most. Also, overreactions are quite external, inherently affecting more than just one person. It's important to address instances when you may have overreacted in order to better recognize future triggers and cut back on them. All in all, if you find that you are constantly irritable to the point where it is obscuring your personality and straining your relationships with people you care about, it is a good idea to talk to a therapist. A therapist can help you work through your problems and find appropriate solutions. 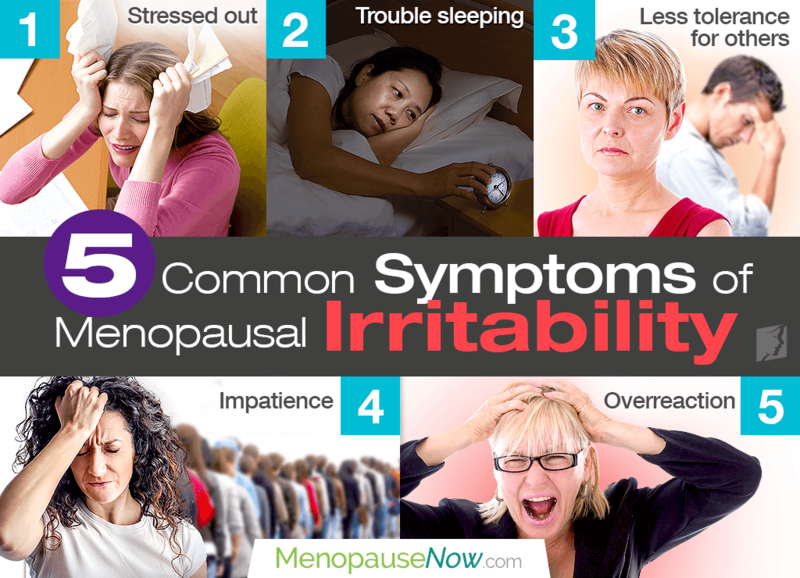 Also, learn more about irritability treatments during menopause by clicking on the previous link. Find a long-lasting solution that works for you, and know that peaceful days lie ahead! When menopausal symptoms become severe, they can have truly detrimental effects on daily life. Daily life is stressful enough to cause the occasional bad mood, but hormonal changes during menopause can trigger additional irritability. No one enjoys having a bad day. Unfortunately, for some women going through menopause, every day can seem frustrating due to chronic irritability. Defined.